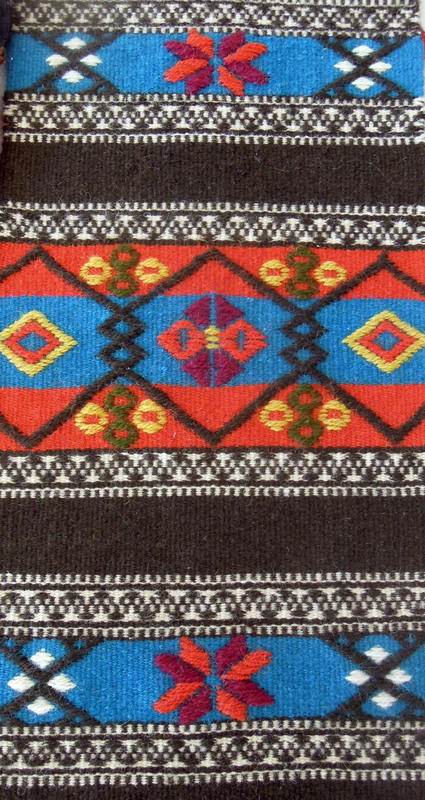 The Scandinavian Weavers met on November 17, 2013. During our show and tell time, some people mentioned the projects they plan to complete this year as part of our “Inspiration” study topic. 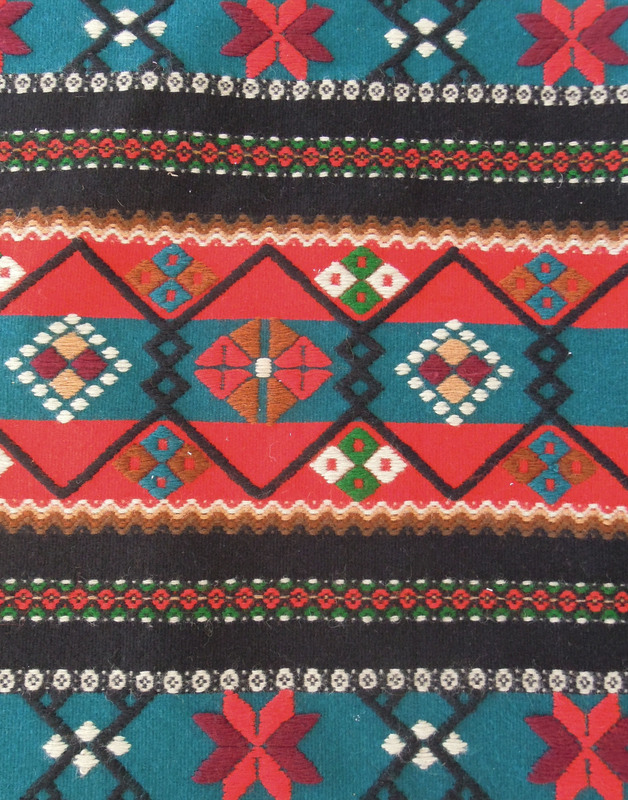 Each member is choosing an old textile and creating a new one inspired by an aspect of the old piece. Many of these pieces are from the Vesterheim Norwegian-American Museum in Decorah, Iowa. We plan to submit the new pieces to the annual National Exhibit of Folk Art in the Norwegian Tradition exhibit next summer. Melba Granlund is planning to weave a piece inspired by a runner she purchased at the Helsinki flea market last summer. A portion is shown here. She guesses it is Swedish. 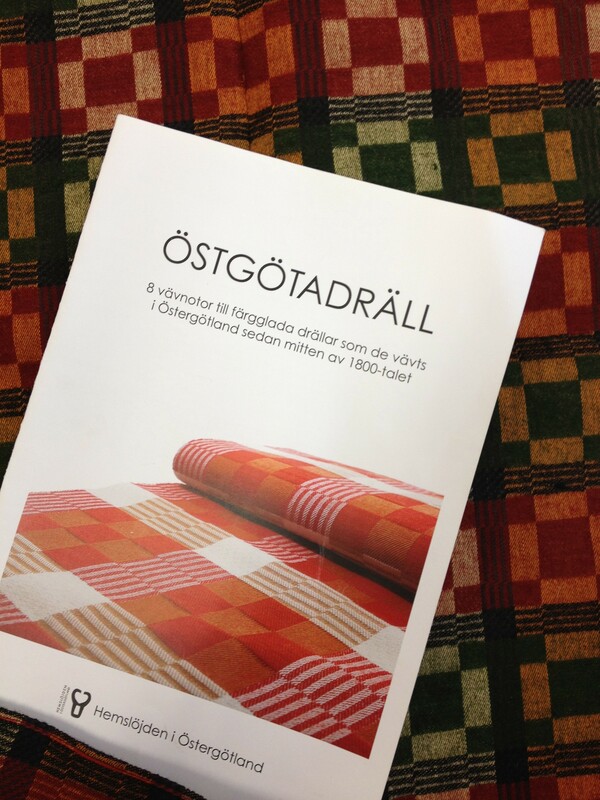 Vesterheim owns a very similar runner, also likely Swedish in origin, according to curator Laurann Gilbertson. And finally, Vesterheim had a small piece that Lila Nelson wove, based on the older piece. Inspired by the designs in these three pieces, Melba will design and weave her own interpretation. In the context of discussing how she would choose the colors for her piece, Veronna Capone mentioned a tip she heard from Jan Mostrom. Take a photo of an existing piece, switch it to black and white, and you’ll see the tonal range. Then you can experiment with colors, making sure that you have appropriate light and dark tones. Smart! 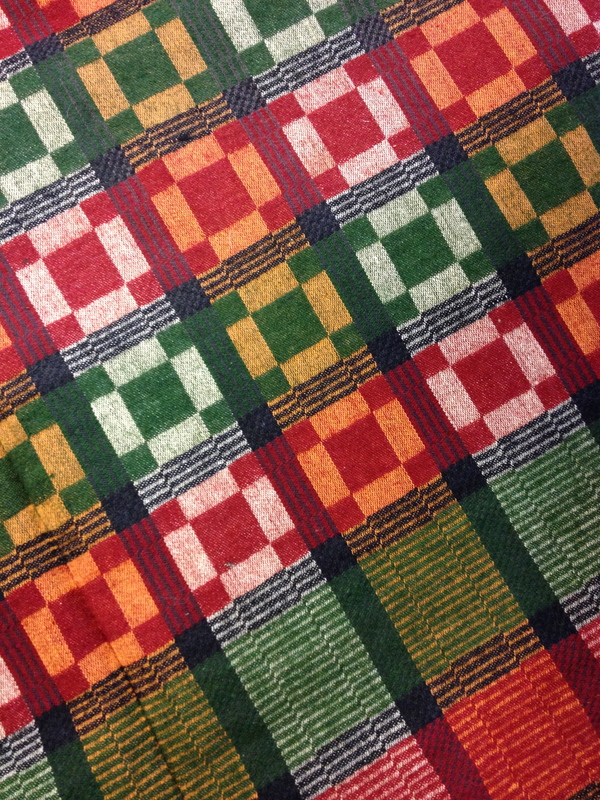 Marilyn Moore brought in a beautiful Swedish tablecloth, owned by a friend. It is probably 90 years old, and in pristine, never-used condition. Marilyn plans to weave a similar, but smaller, piece. When she brought it to show her friend Winnie Johnson, it turned out that Winnie had a Swedish booklet with just the instructions that Marilyn will need! 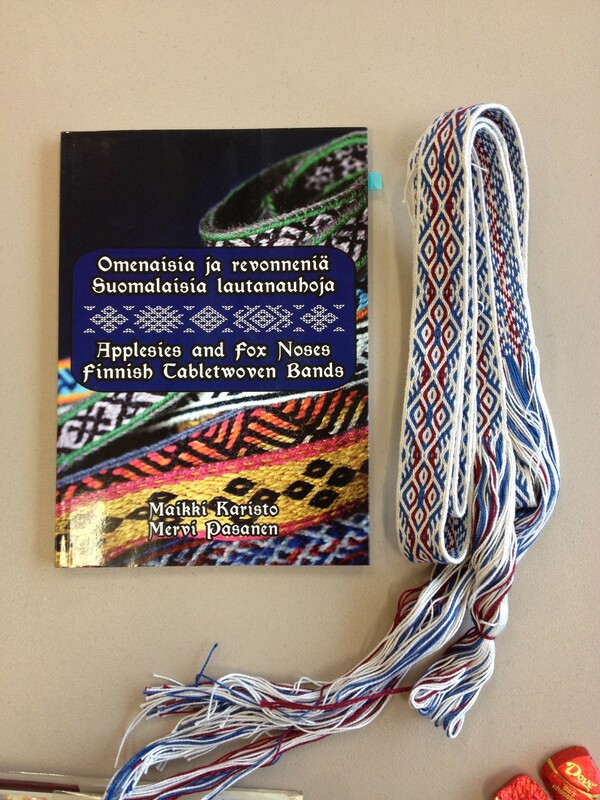 Keith Pierce showed a band that he wove from a recently-acquired book of Finnish bands, Applesies and Fox Noses: Finnish Tabletwoven Bands, by Maikki Karisto and Mervi Pasanen. Keith bought it from a Finnish web site. 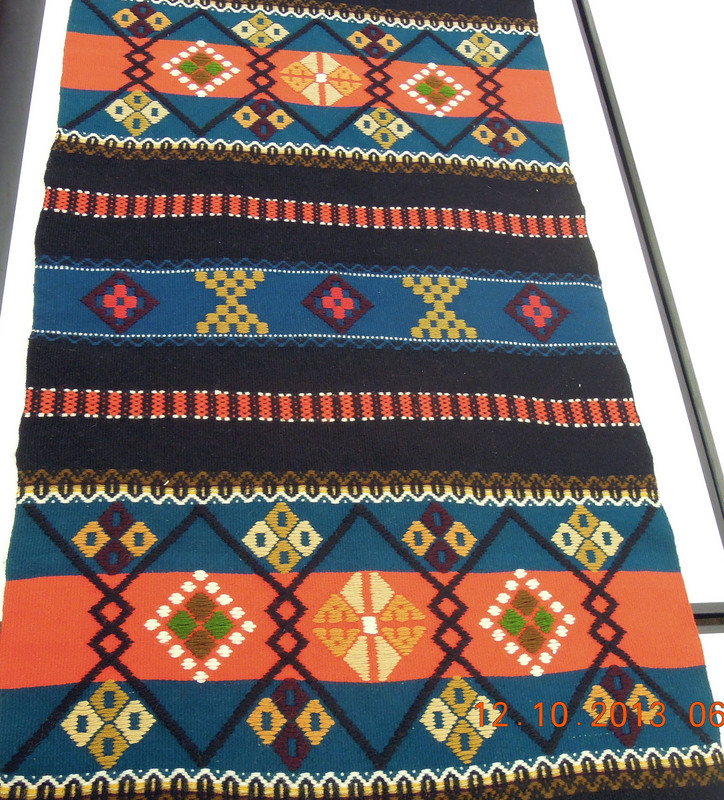 Jane Connett has been struggling with card weaving on her Schaacht inkle loom, and brought it in to illustrate. Robin Meadow said her Glimåkra loom sits empty, but she has plans! Karen Weiberg has been making plans to use her newly-inherited Margaret Bergman loom. It came from her aunt, who carefully saved the original receipts. It cost $85 in 1940. It’s also amazing that the accompanying wooden bench, built with clever storage space, cost $3.00. 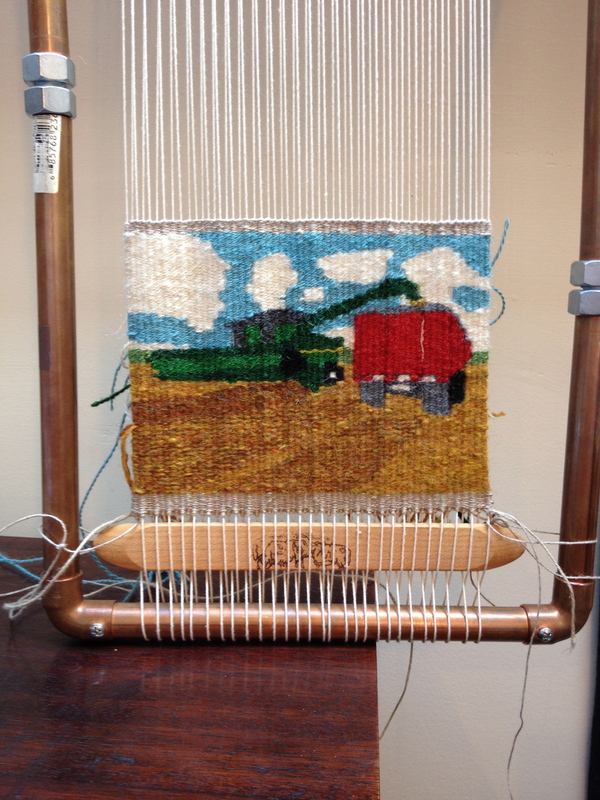 Robbie LaFleur showed her small harvester tapestry test piece (also written about here).